Terry and Christy’s life together started 31 years ago when God put them together via a blind date. They were married 7 months later and raised 2 children. Tiana married Kyle and has two children, Marlee and Benton. They also have a son, Colton. Working in the same company for the past 22 years they began to feel that God had something more in store for their future. After much prayer God made it clear to the Cooper’s it was time to take an early retirement and start praying and preparing for what was next. On February 28th, 2017 Terry worked his last day after Christy had left one month earlier. This started a four month journey searching and praying that started with a one week trip of solitude for Terry. At the end of June God revealed that it was time to sell their house and all their belongings. This was followed up in July with Him revealing an opportunity in Cambodia to work with Stronghold Cambodia (SHC), a Christian Cambodian NGO in Sihanoukville, Cambodia, whose mission is to empower Cambodian communities for positive change through Christian care and learning. 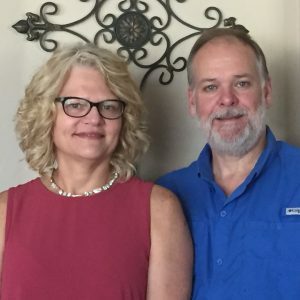 After much prayer and discussion Terry and Christy are excited about what God has in store with Stronghold Cambodia. The Cooper’s are thankful for what God has done and all their family and friends that have been so instrumental in seeing them through this decision.